Just a short article this time, since I'm kind of swamped with work and the start of a new book on Three.js I'm writing for Packt. In this article we'll very quickly look at the state of desktop notifications. 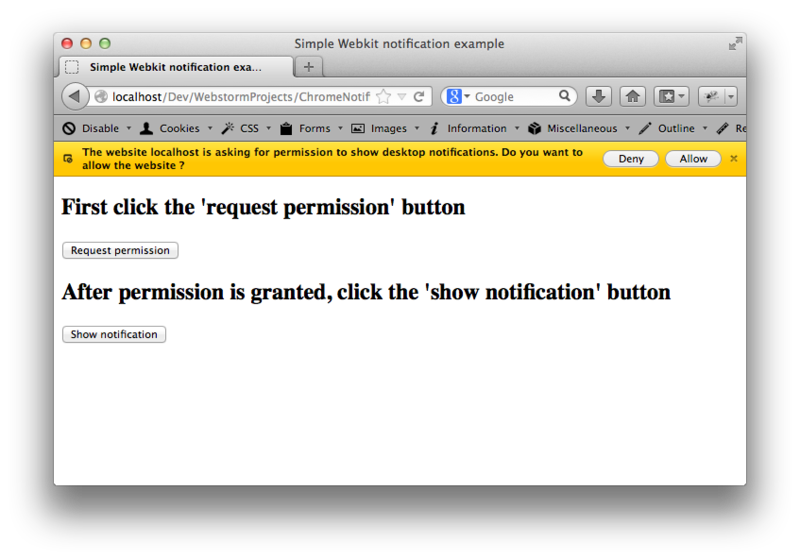 For desktop notifications there is currently a W3C specification, but there aren't any implementations of this standard yet. However, Chrome does have support for Desktop notifications, but for an old version (2006) of the specification. Nevertheless, there are a couple of sites out there that detect whether you're running Chrome, and if so ask your permission to show desktop notifications. On a final note, the firefox guys are currently finishing the implementation of the W3C API, so in a couple of days or weeks, firefox will have it's own set of desktop notifications, without the need for a plugin.